When you are working at height for prolonged periods you need to use scaffolding. 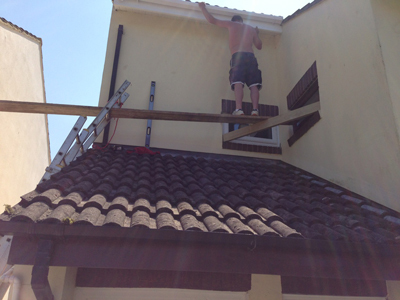 It is not safe or sensible to balance on a ladder to replace windows, fix guttering or replace roof tiles. It is certainly not a good idea to balance scaffold boards (sometimes called scaffold planks) on a ladder like this guy. These DIY’ers have decided to avoid the cost of scaffold tower hire or the cost of having professional scaffolding erected, but the cost to their safety cannot be measured. They may get away with this makeshift scaffolding, but if they continue to work in a way that cuts corners like this, then eventually their luck will run out. When Do I need to use Scaffolding? You can work from a ladder to carry out any building or DIY jobs that are short term jobs, that is they are tasks that can be completed in minutes rather than hours. You can also use ladders where the task is a low risk one, in other words where you will not be balancing heavy objects or leaning out away from the ladder, and where the ladder is not extending over fragile surfaces, and can be properly secured. You can also use a ladder where a risk assessment has shown that is is the safest way of carrying out a job because scaffolding or or other equipment cannot be used for some reason. Contrary to popular belief there is not a maximum height for working from a ladder, but if the ladder rises more than nine meters you should incorporate rest platforms. The HSE, Health Safety Executive has lots of information on safety for builders and anyone working on building projects. In case you were wondering that does include DIYers and Home Improvers, because lets face it, the jobs you are doing are just as potentially dangerous as the ones the professionals are doing. If you are working from a ladder, you should always make sure your ladder is secure, preferably by tying it, or by using a stability device, or wedging your ladder against a wall, see more in our ladder safety project. If you think you might need to use a scaffold tower, have a look at our relevant scaffolding project too.